If you know who this is, you're a basketball fan. If you don't, you'll probably win the pool. 7 days, ladies and gents. That’s all we have left until your Thursday stops being productive at approximately 12:01pm. For many, myself included, things like work, socializing, and/or sleeping begins to become secondary when maybe the two best days of sports happen. 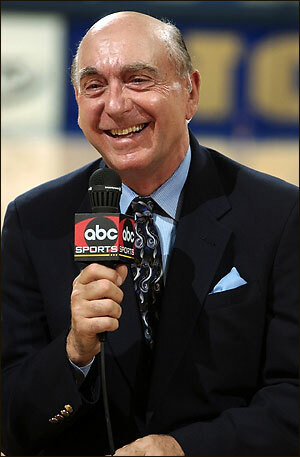 Of course, I’m talking about the first two rounds of the NCAA Tournament. (NOTE: Yes, I know they have now rebranded the Tuesday play in games as the first round. I refuse to acknowledge this. Deal with it.) But even more exciting than watching the games is being able to compete with friends, colleagues, or strangers about who can randomly select basketball games the best. Competition? Basketball? No other sports happening to speak of? Prizes? No entry fee? Sign you up, right? How about you sign yourself up, Mr. (or Ms.) Lazypants. We’ve really done most of the hard work anyway, including but not limited to, lauding Kentucky since the season started. Your welcome for the advice. As for the game, we’re running this through Yahoo Sports this year. The link you’d need to sign up is this one. If you don’t have a Yahoo! username and password, you’ll need to make one, then you’ll need to let me know how you made it through the 90s without one. Continue to read on if you’d like some info about the rules, prizes, etc. Or if you really want to live dangerously, just blindly charge on without really knowing what you’re doing. I’m sure that strategy has flaws, but I’ll be damned if I know what they are. Unlike prior years where people went banana sandwich with multiple entries, this contest is limited to one entry per contestant. If you want to be shady and create multiple Yahoo! accounts just to win a fairly unimpressive prize, then so be it. We would probably need to have a talk about how you value your time however. The scoring system is a little different from the stock Yahoo! scoring. As the rounds progress, the scoring for correct picks increase. 1 point for a first round correct pick, 32 points for picking the national champion. The twist this year is we’re throwing in some upset bonuses. 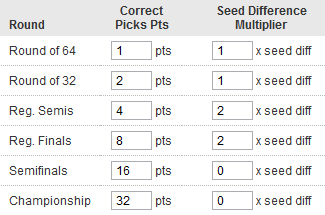 Up until the Final 4, picking lower seeded teams gives you bonus points, assuming you get it right. The difference in seeding multiplied by a round-specific number gives you your total bonus points. Example: Louisville is a 5th seed. They get beat by 12th seeded Morehead State in the first round. Again. The seed difference is 7, the round multiplier is 1, and if you picked Morehead, you get the 1 point for the correct pick and 7 bonus points for 8 total. First two rounds have a multiplier of 1, next two rounds have a multiplier of 2. The Final 4 has no multiplier. As mentioned, there is no buy in. Overall winner: Mini-helmet of the college team of their choosing. We are a football blog after all. Highest First Round Score: To be decided. We’ll figure something out and throw it on the group’s message board. Most Creative Entry Name: A random piece of memorabilia of our choosing. We will take your fan allegiance into consideration, but not a guarantee. This is a highly subjective decision decided by Edge, RV, and myself. We may narrow it down to finalists and let the collective vote. Know your audience if you’re trying to get on our good sides. That’s the long and the short of it, boys and girls. Get yourself signed up and enjoy the next week of talking heads, prognosticators, and learning how someone’s aunt won their office pool three years ago by picking the fiercest mascots, or how a neighbor won their bracket by selecting based on the attractiveness of the starting point guard. March Madness, indeed.